A Kansas kindergartner has emerged as an unlikely viral sensation thanks to her devout adherence to her parents' alma mater, Kansas State. 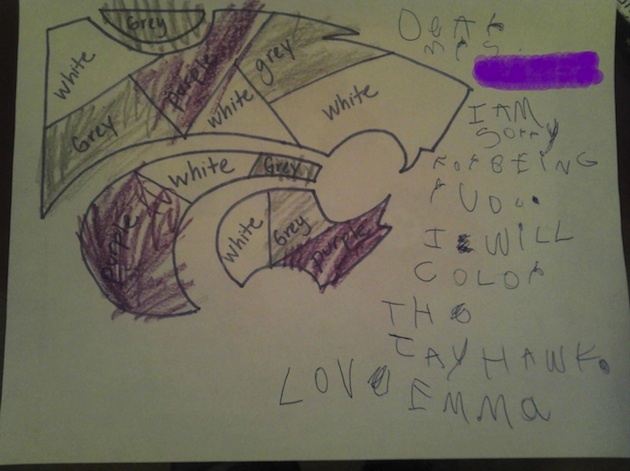 As reported in detail at Lost Lettermen and the Kansas City Star, 5-year-old Emma Burton of Olathe, Kan., refused to participate in a class coloring assignment when she and her classmates were told to color in a Jayhawk, the mascot of the University of Kansas. The coloring exercise was part of the kindergarten class' celebration of the state of Kansas. However, Emma wouldn't comply with her teacher's instructions. Instead, according to her mother -- Bug Bytes blogger Julie Burton -- the four-foot tall tot brazenly refused to color the Jayhawk on the grounds that she doesn't like the University of Kansas. She took the Jayhawk sheet she had been handed, walked up to her teacher and asked for a Powercat (the mascot of Kansas State) to color. 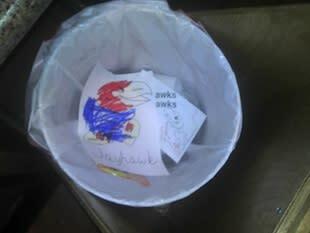 When Burton was told there weren't any Powercats to color, she threw the Jayhawk in the trash. That is one headstrong kindergartner. Yet, incredibly, Emma Burton's Jayhawk resistance was just beginning. The kindergartner was reprimanded by her teacher but still refused to color the Jayhawk. The teacher angrily approached her mother about the incident after school and Julie Burton then took her daughter home, at which point the following incredible bargaining session occurred. Emma, you need to color this thing. The teacher might have to send you to the principal's office. Hmmm…Ok. What if I make you a deal. What if I print out a Powercat and you color it purple, grey and white. Then write an apology to your teacher because you were rude. Will you agree to that? Ok, but you need to color that Jayhawk for your teacher. Yes. But I don't like it. And I'm wearing a K-State shirt tomorrow. Fine. You don't have to like it. Just do it and I want you to tell your teacher you're sorry as well. Burton did color the Jayhawk. She brought it to school, along with the terrific Powercat apology note (complete with redacted teacher name that you see above). And the next day, after the Jayhawk had officially been recognized by her teacher, little Emma Burton threw it in the trash at her house. It is impossible to know what the future holds for Emma Burton. She may very well attend Kansas State like her parents did. She may attend Harvard, or Oberlin, or any number of different terrific schools from across the country. She may go on to work in science, as a writer, or even as a general in the military (given her current personality, this might be an excellent choice). In the meantime, the youngest Kansas State diehard is already an Internet celebrity. On Monday she was honored during the Kansas-Kansas State game as the school's fan of the game (the Star said she was really most excited about getting to meet Willie, the Kansas State mascot). Lost Lettermen even reported that the Kansas State president wrote her a letter to jokingly offer her a scholarship for 2025. All of that could lead to a very purple future for the kindergartner. Or it might not. Life is funny that way. The only thing we can all rest assured about is that there is absolutely, positively no way that Emma Burton will be attending the University of Kansas. At this point, that's probably perfectly fine with Jayhawk fans, too.